Sargent County is located in the southeastern part of North Dakota, bordered on the south by South Dakota, on the east by Richland County, on the north by Ransom County and on the west by Dickey County. The county is 864 square miles with a total of 547, 200 acres. 523,815 acres of farm land , (which includes 2108 acres of Game and Fish land) 10, 485 acres are owned by the U.S. Fish & Wildlife Service, the balance is in lakes, roads, town sites, airports, etc. There are 271 miles of county roads, 835.75 miles of township roads and 97 miles of state highways. 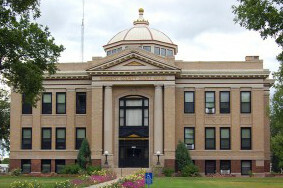 The Sargent County Courthouse is ADA compliant. Accessibility is located on the southwest side of the courthouse for parking and elevator access. In the spring of 1879 a government survey party led by E. H. Antwerp came into the county at a point, which is now called the Sisseton Hills. At that time there were no white settlers, by the next year some white people, mostly Norwegians and Germans had come into the area and staked claims. From 1880 to 1890 most of the pioneers moved into the county following the building of the Soo, Great Northern and Northern Pacific railroads. Sargent County was created from the southern half of Ransom County, and named in honor of H. E. Sargent, who was an official of the Northern Pacific Railroad. The railroad built its line into Milnor in 1883, across the county and into Oakes by 1900. On July 16, 1883 Territorial Governor Ordway appointed the first commissioners and designated Milnor as the county seat. The following year the first county election was held and Forman was chosen as the county seat. In 1920 the counties population peaked at 9655. At the turn of the century there were 18 towns in the county. Now there are seven cities: Cayuga, Cogswell, Forman, Gwinner, Havana, Milnor, and Rutland. There are six unincorporated villages: Brampton, Crete, Delamere, Geneseo, Stirum and Straubville. There are 24 townships. The average farm size has grown from 300 acres in the early 1900's to 1025 acres in 1995. The first farmer was John Longie of Tewaukon and the first community was Hamlin in northern Herman Township. Artifacts have been found dating hundreds of years before the white man came to the area. The Mandan, Hidatsa, Blackfoot, Cree and Chippewa were gone before the settlers arrived. The Sioux were the only tribe left in the area. The writing rock known as the Alter Stone, arrow points, spear points, pottery, hammers and tethering stones have been found in all parts of the county. The Alter Stone was purchased by a man from Britton, SD and moved to that city. The main industry is Doosan Bobcat in Gwinner, home of the Melroe Bobcat skid steer loader. There are three school districts, Sargent Central in Forman, North Sargent in Gwinner; and Milnor. There are five county commissioners, elected at large.